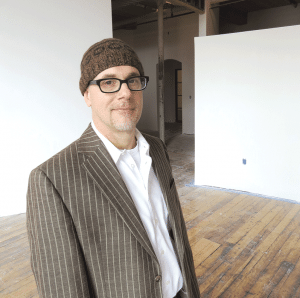 As John Aubin talked about Open Square, the massive former mill complex along the canals in downtown Holyoke that has been his passion for the past dozen years or more, he continually referred to it as an “urban laboratory” — for architecture, planning, sustainability, and economic development. By that, he meant this was a place to experiment and drive innovation in response to an ongoing movement that has more people apparently willing and able to work, live, and locate businesses in urban settings, although many cities are struggling to take full advantage of that phenomenon. To succeed in this environment and move the needle in Holyoke when it comes to attracting businesses there, Aubin said he doesn’t focus on filling square footage in an old mill. Rather, he’s committed to creating workspaces in which business owners can thrive. Aubin believes this philosophy is working and creating great progress in his laboratory. Over the past decade, he told BusinessWest, he’s been adding five new businesses a year, and all of these ventures are new to downtown Holyoke. The tenant list now includes more than 50 companies employing more than 200 people in sectors ranging from healthcare to technology; from insurance to marketing; from finance to hospitality. And the latest addition to that list could be one of the most significant. VertitechIT, a networking and IT engineering company that provides a wide range of services to clients, many of the them in the healthcare sector, is planning to move into 3,500 square feet of custom-designed space on the mostly undeveloped third floor of what’s known as Mill 4. And it could expand into more than 9,000 square feet across the hall if the firm successfully consolidates currently outsourced services on that site, as planned, said the company’s president, Michael Feld. “We’ll need that space for a 24/7/365 support center with probably 25 to 30 people in it,” Feld said, adding that, even if those plans do not come to fruition, the company will likely continue its pattern of doubling in size each year and will certainly need additional space. VertitechIT’s new offices, which should be ready for occupancy next month, are an example of Aubin’s efforts to create an attractive, efficient, custom (that’s a word you’ll read again) work environment that makes Open Square — and Holyoke — an attractive destination for businesses across many sectors. “We wanted a space that is quite presentable to clients, but the real value is to the engineers,” Feld explained. “For example, everybody loves whiteboards, so all the walls are curved, with large expanses of painted whiteboard so you can write on it. And our conference-room table is glass that you can write on as well. Looking forward, Aubin said he plans to continue his pattern of steady growth. What direction it will take is still to be determined as Holyoke continues its comeback from the extreme hard times of the ’70s and ’80s, fueled by the loss of thousands of manufacturing jobs and demographic shifts that saw the nation’s first planned industrial city become one of the poorer communities in the Commonwealth. Recent developments such as the Massachusetts Green High Performance Computing Center, the emergence of a creative economy, and a more positive outlook about the community could attract many different kinds of businesses to the city — and Open Square, said Aubin. Meanwhile, plans to bring rail service to Holyoke could open other kinds of doors, he said, adding that there is preliminary talk about the prospects for developing a hotel at one of the mills on the Open Square complex (more on that later). For this issue and its focus on commercial real estate, BusinessWest toured Open Square, gaining a perspective on both the many new developments there in recent years and possible future development on this historic site. As he elaborated on that notion of Open Square as a laboratory, Aubin referenced that trend toward urban living and working. He said Holyoke is squarely in the middle of this phenomenon, and perhaps better positioned than others to take full advantage of it. “We all know that, over the past 10 years, the world has become more urban. Demand is growing for urban space,” he explained. “Holyoke, and many small cities in this country, have enormous potential — they represent a tremendous, untapped market. And what I do is take a design-based approach to taking advantage of that, to leveraging what is really a very strong market. Setting the tone in this new and emerging urban landscape has been Aubin’s unofficial job description since he started filling in the canvas that is the historic mill complex his father purchased in the mid-’60s but then struggled to fill as Holyoke went into its long and pronounced tailspin. The Great Recession that officially began in late 2007 and continued into late 2009 slowed his progress somewhat, but Aubin has been able to successfully fill nearly 100,000 square feet of space with everything from a successful events facility called Mill 1 (that’s where it’s located) to arts groups such as the Massachusetts Academy of Ballet, to energy and environmental companies such as Sovereign Consulting. As he’s filled in floors on Mill 1 and Mill 4, he’s done so with the approach that, while he’s willing to experiment in his laboratory, there are limits on what he’ll try. “As a private business, I don’t have the luxury of experimenting on things that are not going to work or where the costs are too high — I’ve been to able to identify markets and capture them, and ideas that don’t work were discarded quickly,” he said, adding that this reasoning explains why there is only one residential unit in the complex — one that Aubin lived in himself for a time and then Holyoke Mayor Alex Morse called home for a while before buying a house in the city — and also why there is a comparatively small number of artisans, specifically those who do what they do for a living, not a hobby. So Aubin continues to focus his experiments on what he believes — or knows — will work, and this brings him back to that notion of creating attractive but also affordable environments in which to do business, but also in which to stage weddings and other types of events. And Open Square, with its great critical mass, provides seemingly endless opportunities for doing so. “Because we have this great foundation, this wonderful building to work with, we’re able to do beautiful, custom-designed space at a very affordable rate that’s difficult to match,” he said while making a clear distinction between affordable and ‘cheap,’ something Open Square is not. These ingredients allowed Aubin to successfully fill Mill 4’s second floor with what he called “studio space,” generally one large, open room with build-out costs much lower than what was created two floors up. There, Aubin has created larger, custom spaces, up to 3,000 square feet, for an eclectic mix of clients, ranging from Common Capital to Cover Technologies, an environmental company, to Emergent Billing, which focuses on the healthcare industry. Plans to create still-larger custom spaces on the third floor, which started with buildout for Sovereign Consulting, were sidetracked by the recession, said Aubin, but with the economy improving, those plans are now moving forward, starting with VertitechIT. This artist’s rendering shows the unique features in the space created for VertitechIT, including curved walls and a centrally located conference room. 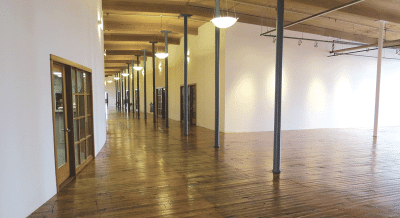 In many ways, that company’s arrival provides an effective example of how Open Square is deepening its tenant list by creating custom work spaces that put Holyoke — and the mill complex — on radar screens they would not have been on years ago. Launched in 2001, the company was located in Northampton for many years, where the fit wasn’t perfect, for several reasons, said Feld. “It’s hard for companies like us to exist there — they want retail, and we’re not that type of organization; we don’t match what the town is looking for and is prepared to work with,” he said, adding that this mismatch was compounded by the fact that the company quickly outgrew its quarters. “We were just hanging on by packing people into every corner. We loved Northampton, but we simply ran out of space and couldn’t put it off any longer,” he said, adding quickly that Holyoke wasn’t on his short, or even long, list of possibilities for relocation. Then came meetings with the mayor, school department leaders, and business executives, and Feld came away with the opinion that Holyoke should be his new business address. • A curved conference room whose central position emphasizes VertitechIT’s collective brainpower and focus on creating solutions for clients. Looking forward, Aubin said the obvious goal is to create more of these matches as controlled experimentation continues in his urban laboratory. What shape it will take remains to be seen, he noted, adding that, in many ways, Open Square will evolve as Holyoke does. Elaborating, he said the planned return of rail service could drive economic development in many ways, because it will make the city more accessible — to workers, business owners, and even tourists. “We’re looking at what the future is for this region, how soon it will get here, and how quickly we can move on it,” he explained. “The train will certainly open up opportunities — it will make commuting easier and open up markets as far south as New York City. The juxtaposition of those words speaks volumes about how he views his broad-ranging responsibilities with the company. In short, he’s an architect first, and he believes his focus on design and creating attractive, efficient working environments is helping Holyoke and Open Square reach that vast potential he mentioned, taking full advantage of the shift to urban living and working. At the moment, he has designs on continued growth and leveraging the tremendous asset his family has owned for close to a half-century now. And he’s confident that the pieces are in place for that to happen.